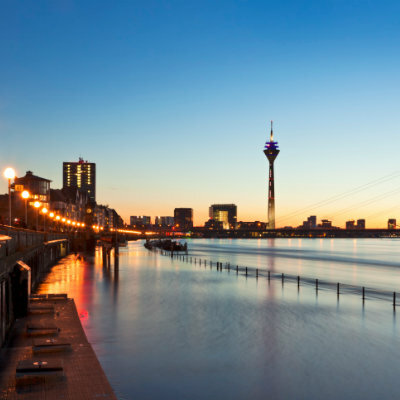 In approximately 15 months, the printing and graphics world will once again gather in the city of Düsseldorf, Germany, for the quadrennial (soon to be triennial) ‘drupa’ trade fair, the world’s largest and most important event for the industry. A portmanteau word short for ‘druck un papier,’ drupa – yes with a small ‘d’ – has evolved into the focal point for new technology launches, trend forecasting, networking and above all, change in the printing, packaging, paper, publishing and graphics sectors. Driven by Germany’s post-war dominance of offset, letterpress and gravure press manufacturing, the first drupa was held in 1951 with each show growing in size and international appeal. It was not until drupa 1995 that the first digital presses made an appearance, and the four drupas since then have each seen a marked increase in exhibition area dedicated to digital printing and finishing technologies. In fact, drupa 2016 will more than likely have more floor space dedicated to digital than to conventional offset in its 17 enormous halls. Ironically, the reason the world’s largest printing trade fair evolved in Germany – massive local manufacturing – is no longer a driving factor. The same is true for the world’s largest photographic trade fair, Photokina, held in nearby Cologne. Almost all of the burgeoning digital print technologies have been developed outside of Germany in places like Japan, the USA, Israel, the UK, Belgium and even Australia. The on-going success of drupa in the face of declining German and European manufacturing of printing technologies, lies in the excellence of the organization, support of the good burghers of Düsseldorf – the whole city and surrounds gets behind drupa – and the recognition that you can’t stop change by burying one’s head in the sand. More and more international visitors flock to drupa every four years (soon to be three! ), recognizing it as the measuring-stick for the industry and a place where more printing intelligence can be gathered than anywhere else on Earth. At the last drupa in 2012, 314,000 visitors (60 percent international) attended over 12 days and 1,844 exhibitors displayed their wares. So, given that digital printing currently accounts for only around 10 percent of the world’s USD$950 billion printing market, why is there so much attention being lavished upon it? The answer must surely be growth and profit. The Smitherspira report The Future of Global Printing to 2018 clearly shows that digital methods of printing are growing in both value and volumes, at the expense of offset printing. Other research shows that digital, in terms of total tonnage of papers printed, accounts for only 4.5 percent of global volume but that digital sheets printed in shorter runs command a higher price – something that is good for both the printer and the materials supplier alike. This skews the market share in dollar terms as the way offset, flexographic and gravure print is purchased more like a commodity: bulk purchasing in large orders but at low profit margins. Digital orders, on the other hand, are typically in smaller lots, more frequently and more conveniently for the customer. This means individual order values are lower but because the dollar amounts are not ‘scary’ to the customer – they can command higher profit margins without complaint. Printing digitally becomes more like a service industry, unlike the ‘manufacturing industry’ nature of high volume conventional methods. As we all know from prices in Seven-Eleven stores, service and convenience comes at a slightly higher price. Inkjet web presses have proved popular in the transactional and direct mail markets, more for their ability to print variable data at high speeds instead of pre-printed offset ‘shells’ with a mono digital overprint. Such presses include the Fujifilm Jet Press 540W which can print full process colour across a 540mm, web at speeds of over 100 metres per minute. The short-run book-printing sector has also embraced high speed inkjet web presses wholeheartedly. With graphic/informational printing applications static or in decline, many producers are turning to packaging, point-of-purchase and labeling in order to garner a slice of these high growth sectors. Large format flatbed UV digital printers such as those from Inca Digital and Fujifilm are increasingly being used for short run packaging jobs of folding cartons when combined with an automated diecutter such as a Zund, Kongsberg or Aristo. Label printing using inkjet digital web machines such as the Fujifilm-backed Graphium from FFEI (Fujifilm Electronic Imaging) is becoming more common as run lengths and the desire for different versions of labels grows. Short runs of labels can easily be achieved on wide-format printers such as Fujifilm’s Acuity 1600LED and even coated digitally. Labels are then die-cut offline on one of the readily available and inexpensive die cutting plotters. As sheet sizes for digital presses increases, so the packaging applications also grow. Fujifilm’s Jet Press 720 is a B2 (750mm x 530mm) sheet size inkjet digital press ideal for short-run packaging as it can print on heavier thick stocks used in the folding carton industry. Whatever the digital application, it all needs controlling by a well-constructed workflow, such as Fujifilm’s XMF. Although more than a year away, Fujifilm has already committed to showing all of its digital printing technologies, plus some new ones, in Hall 8b at the highly anticipated drupa trade fair from 31 May to 10 June, 2016 in Germany. Will this one finally be the definitive ‘digital drupa’?